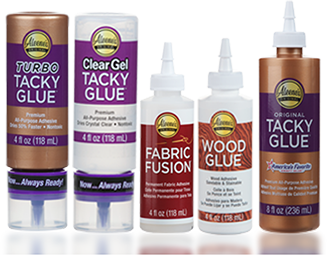 Aleene’s Original Glues - Why is Original Tacky Glue thicker than other white craft glues? Why is Original Tacky Glue thicker than other white craft glues? Aleene’s uses a specially formulated resin in the Original Tacky Glue formula that gives it a high initial “tack” (grabbing power) and bonding strength. Original Tacky Glue’s thick formula helps it grab and hold items on contact. Other craft glues tend to use more “filler” materials and less adhesive materials, causing the glues to be less effective.